A foam roller that really holds its shape! Our foam roller is a high-performance, professional roller made of top-quality closed-cell foam, so it holds it round shape. It has a non-skid, ''grippy'' surface that prevents sliding, improving the accuracy of movement. The versatile foam roller adds another dimension to mat exercises, and is a fundamental tool in Pilates, yoga, and myofascial massage therapy. Using the foam roller improves strength, flexibility, balance, and coordination. Foam rollers are 6'' in diameter by 36'' long, and weigh just over 2 pounds. They're also available in 12'' length. LOVE this roller! This roller is a perfect way to start your rolling adventures! I will continue to use and buy this product. I ordered 50 rollers for our employees. The price was great,customer service with the company was great. We received the products very quickly. The product itself is durable and does the job it is intended for. I cannot speak for how long it lasts, but it is what we wanted. Great deal for the length! I love having this 36" foam roller. I've been use to shorter rollers so this is a nice upgrade. I got black and it looks nice. As a yoga and Pilates instructor I've started foam rolling to release tension in my shoulders and neck. The longer length is more comfortable than shorter foam rollers because now my shoulders won't hang off the sides. Definitely recommend! 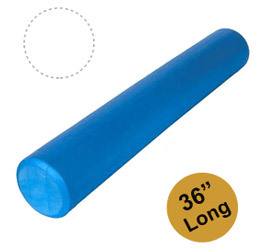 Bought several Blue foam Rollers for use in Pilates training and mat classes. Good firmness - very similar to much more expensive brand name rollers. I'm very pleased with the tubes. Product is as described. Very good for rolling out trigger points. Already feel so much better since I started using this roller a week ago. Shipping was very fast. I would definetly buy from Yogdirect in the future.